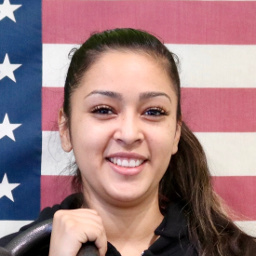 My name is Aurora Ramirez and I have been a 1:1 personal training client of Elite Spartans for over 2 years now. I absolutely love Elite Spartans and what it stands for, as I’ve worked hard for two years and am so happy with my results. I also love the level of customer service that is provided here, which is why I wanted to work for Elite Spartans. I have just recently officially joined the team as Alex’s assistant and Front Desk Manager. I’m really excited for this journey with this amazing team! Aside from being Alex’s assistant and continuing to be a client (the workouts are addicting! ), I am also a massage therapist. I have a total of 7 years of experience, 6 years working with a chiropractic office. Massage is the main reason I started training with Elite Spartans because I needed someone to hold me accountable and push me to a level of fitness that even I never thought I would achieve. I also found that the stronger I got because of my gym sessions, the better quality of massage I was able to deliver. Massage can be a physically demanding job and being physically fit and healthy really helps make it a lot easier. Elite Spartans has enlightened my life in so many different ways. I love the energy of this gym and I enjoy spending time here and getting to know all of the clients, as well as assisting Alex and ensuring the best level of customer service is delivered. I am excited to be a part of the team and help encourage fitness in others’ lives.